The Galaxy S6 was Samsung's boldest step yet and while the phone sold in droves, the complaints came in similar measure. Getting rid of the microSD slot, changing its mind about waterproofing, the protruding camera, the sealed battery. The message from consumers was heard loud and (mostly) clear and the Samsung Galaxy S7 resolves all but the last complaint - the battery is still non-removable, but the company thinks long battery life and fast charging methods (both wired and wireless) are a good enough substitute. Apple works differently. In the producer-consumer relationship, it's the company that sets the expectations, not the buyers. So it's more about "what will they come up with next?" rather than "why did they remove this or that?" The big additions this year were 3D Touch, 4K videos and Live photos, we'll cover those in their respective chapters. The finish aside, both phones are essentially the same shape, with rounded sides that help ergonomics. 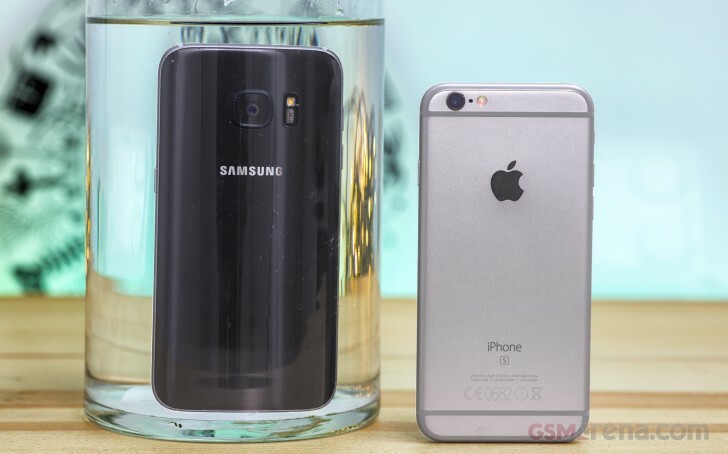 The Galaxy S7 is slightly bigger in all dimensions, due to its bigger screen and battery. As for the materials, both use metal and glass, just in different proportions. Samsung flaunts a glass back, a more premium version of the glossy plastic phones the company used to be known for (memories of smudgy, oily piano black plastic came flooding in). Perhaps it has something to do with wireless charging - true, Qualcomm has a solution for metal-backed phones, but pushing as much electricity as Samsung wants is going to be difficult. "Fast wireless charging" is as fast as the standard issue 5V/2A wired chargers many phones come with, going against the preconception that wireless charging is slow. Apple has been reluctant to adopt this wire-free charging mode, plus it needed to break away from the glass-backed look of the iPhone 4. Both metal and glass suffer from durability issues compared to the less attractive polycarbonate. Still, we think the durability angle works in favor of the iPhone 6s. Anodized metal handles scratches much better than glass and while it is prone to dents, at least those dents don't develop into cracks. Some independent testing shows Galaxy S7's back glass cracks more easily than the front. Both are Gorilla Glass 4, suggesting that the back panel is thinner (to save weight, most likely). Cosmetic damage aside, the S7 is IP68 certified, meaning it can survive under 1.5m of water for half an hour. You probably don't want to test it to its limit, but everyday spills will just slide off the S7. Unlike the S5 brand of waterproofing, the new model does not require any unsightly flaps over any of its ports (forgetting to seal those up was a recipe for disaster and dealing with them every time at every charging was a hassle). The other major advantage over the iPhone is cheap storage - the Galaxy S7 starts off with more to begin with, 32GB vs. 16GB, and you can use a microSD to add up to 200GB more where the iPhone 6s tops out at 128GB. And that one comes at a hefty $200 markup while a 128GB Samsung Pro+ card (rated at 95MB/s read, 90MB/s write) is ~$120. That's not as fast as the built-in UFS storage, but it won't be an issue. The camera on the S6 protruded significantly, but the Galaxy S7 is slightly thicker and the camera sticks out no more than it does on the iPhone 6s. The camera is no longer a "hump"
Winner: Samsung Galaxy S7. Even if you find the iPhone metal back attractive, the cheap storage upgrades and the piece of mind when it comes to water damage risks, should be enough to secure the win for the Samsung-born flagship in this category.